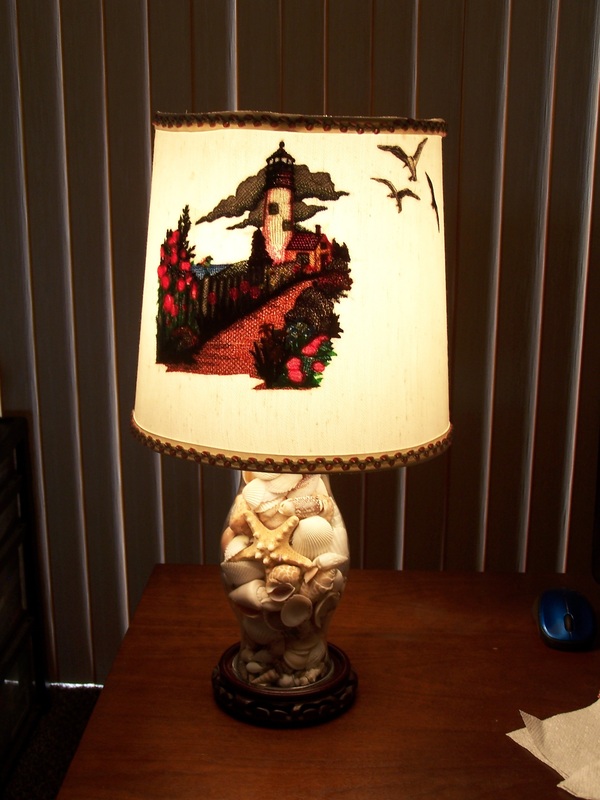 Lighthouse Shell Lamp Size is 20 inches from base to top of shade. 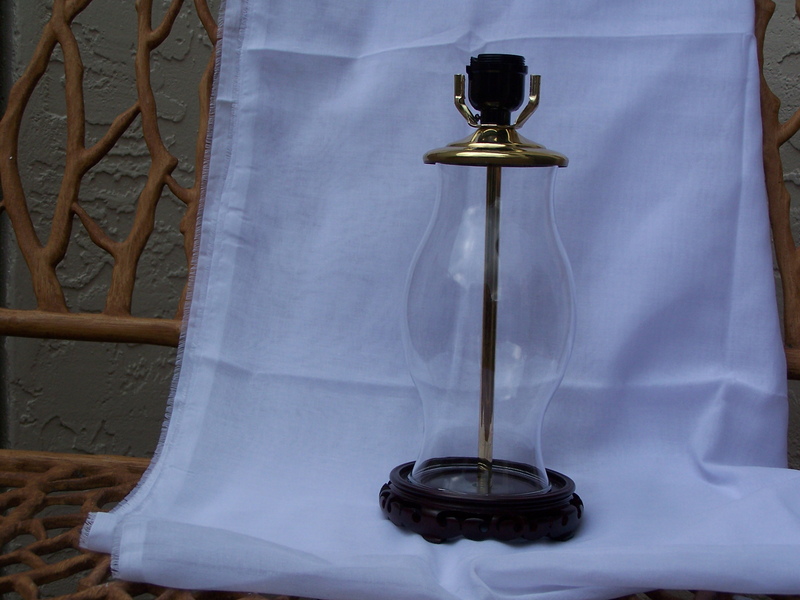 The lamp is a hurricane chimney shape glass set on a wood base. We make the shell lamps from our selected shell supply. The shells and the starfish can vary. 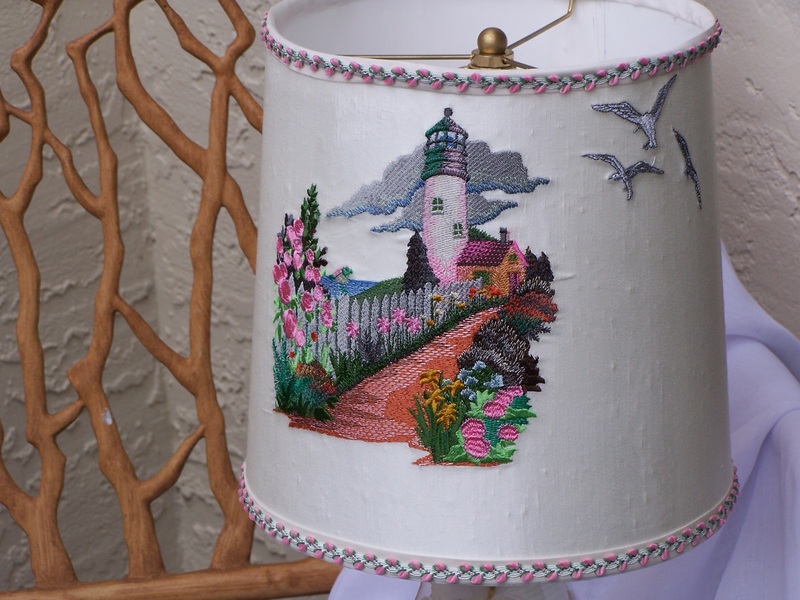 We also make the embroidered shade. The shade was described earlier. We make our own shades so depending on the demand it could take up to 5 days to make yours. Completely wired shell lamp with a 3 way switch. It has no shade. The lamp is composed of Amber colored sea glass mixed with clear and frosted sea glass. The glass is a hurricane chimney shape. It has a sprinkling of white seashell mix. The base is wooden. Size is 12 inches from base socket. 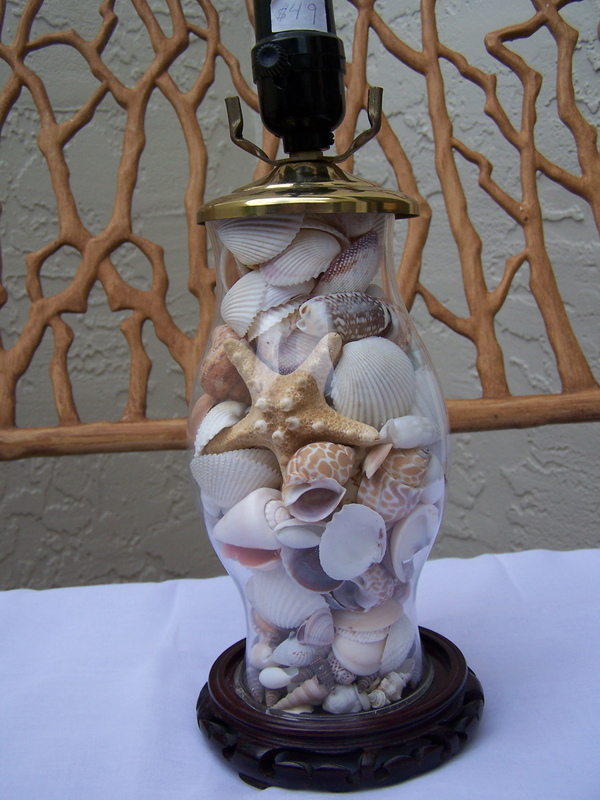 We make the shell lamps from our selected shell supply. The shells and the starfish can vary. Please note, if you order a pair the shipment will be combined and the shipping cost will likely be less. You will be refunded any shipping overcharge. Completely wired shell lamp with a 3 way switch. It has no shade. The lamp is a mix of clear and frosted sea glass, with mix of white shells. It has a sugar starfish and a branch of black sea fan. The glass is a hurricane chimney shape. The base is wooden. Size is 12 inches from base to socket. 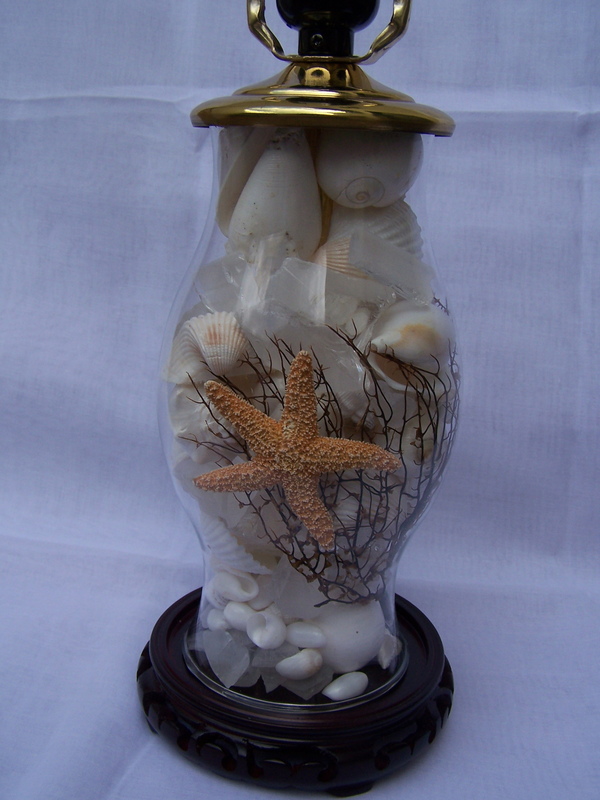 We make the shell lamps from our selected shell supply. The white shells and the starfish can vary. Please note, if you order a pair the shipment will be combined and the shipping cost will likely be less. You will be refunded any shipping overcharge. Completely wired shell lamp with a 3 way switch. It has no shade. 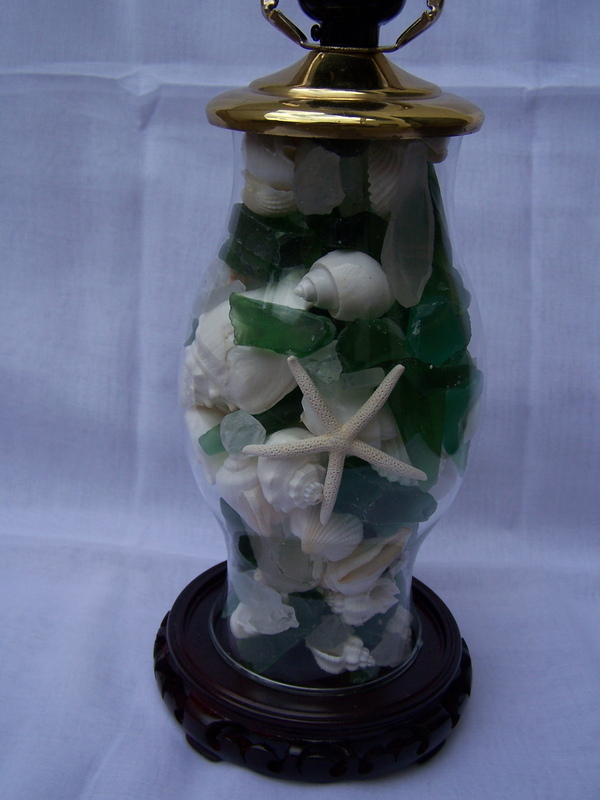 The lamp is a mix of emerald, clear and frosted sea glass, with variety of white shells and a white starfish. The glass is a hurricane chimney shape. The base is wooden. Size is 12 inches from base to socket. 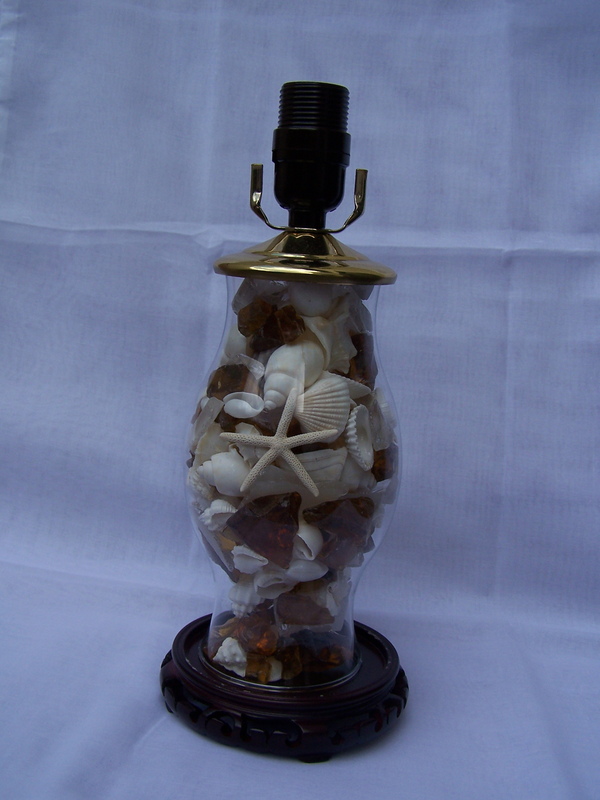 We make the shell lamps from our selected shell supply. The white shell mix and the starfish can vary. Please note, if you order a pair the shipment will be combined and the shipping cost will likely be less. You will be refunded any shipping overcharge. Completely wired shell lamp with a 3 way switch. It has no shade. 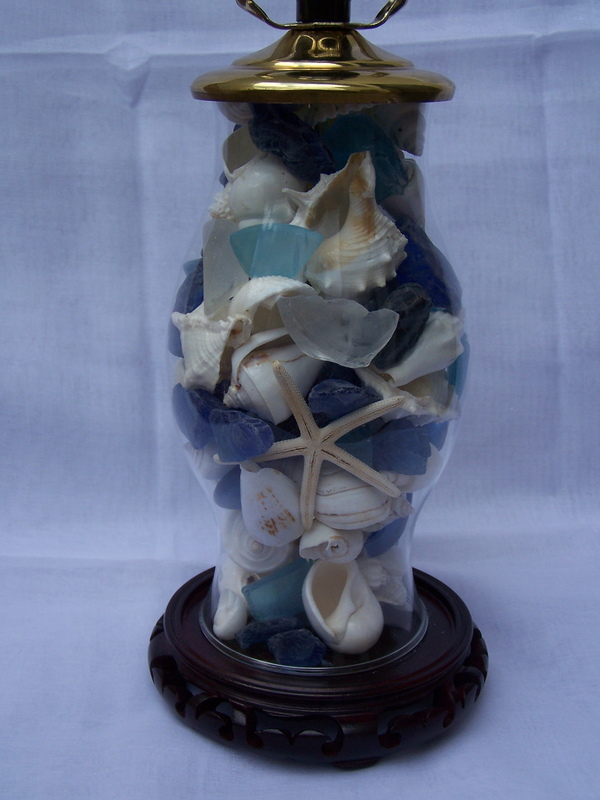 The lamp is a mix of Blue, Clear and Frosted sea glass, with variety of white shells and a white starfish. The glass is a hurricane chimney shape. The base is wooden. Size is 12 inches from base to socket. We make the shell lamps from our selected shell supply. The white shell mix and the starfish can vary. Please note, if you order a pair the shipment will be combined and the shipping cost will likely be less. You will be refunded any shipping overcharge. Completely wired shell lamp with a 3 way switch. It has no shade. 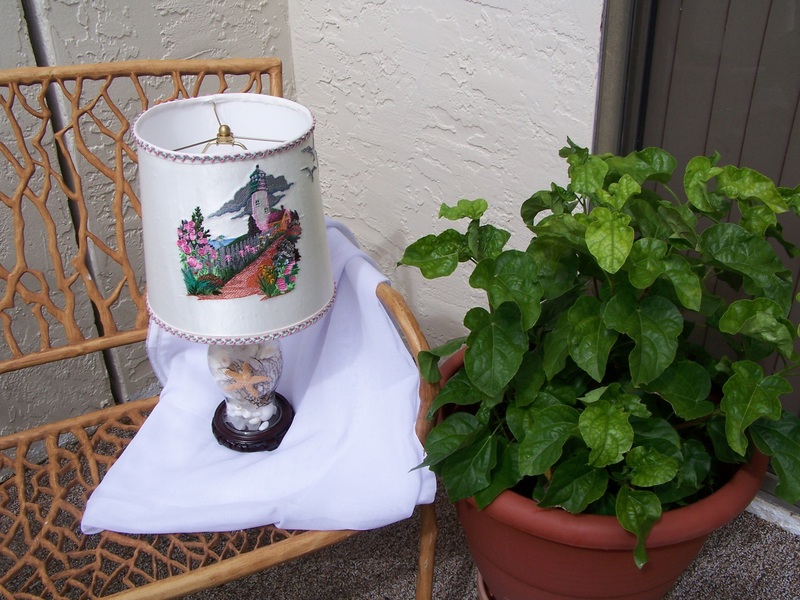 The lamp is a mix of our shells. The glass is a hurricane chimney shape. The base is wooden. Size is 12 inches from base to socket. We make the shell lamps from our selected shell supply. The shell mix and the starfish type will vary. Every lamp is unique to itself. Please note, if you order a pair the shipment will be combined and the shipping cost will likely be less. You will be refunded any shipping overcharge. Completely wired shell lamp with a 3 way switch. It has no shade. You can fill this lamp with your own shells. The glass is a hurricane chimney shape. The base is wooden. Size is 12 inches from base to socket. Please note, if you order a pair the shipment will be combined and the shipping cost will likely be less. You will be refunded any shipping overcharge.